BizReport : Research Library : Osterman Research, Inc.
BACK TO OSTERMAN RESEARCH, INC. Rewards in the context of new business opportunities that can be created, the competitive differentiation that a company can enjoy from intelligent use of social media, the ability to build customer loyalty, and the new channels of communications that open up with current and prospective customers. Risks from the inappropriate content that can be posted on social media sites, the malware that can enter a network through short URLs or phishing attacks, and the failure to retain important business records posted on social media. 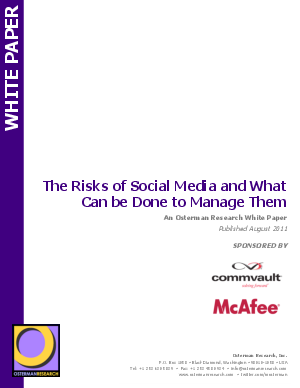 In short, although social media is a relatively new communication and information management channel relative to more traditional tools like email or instant messaging, the same fundamental management requirements apply: social media must be monitored for malware and inappropriate content, and relevant business records sent through social media must be retained and easily accessible for as long as necessary.